Is it me or is the “Spring Weather” a little confusing these days? Most mornings I don’t know if I should grab a sweater, a kimono or a coat! 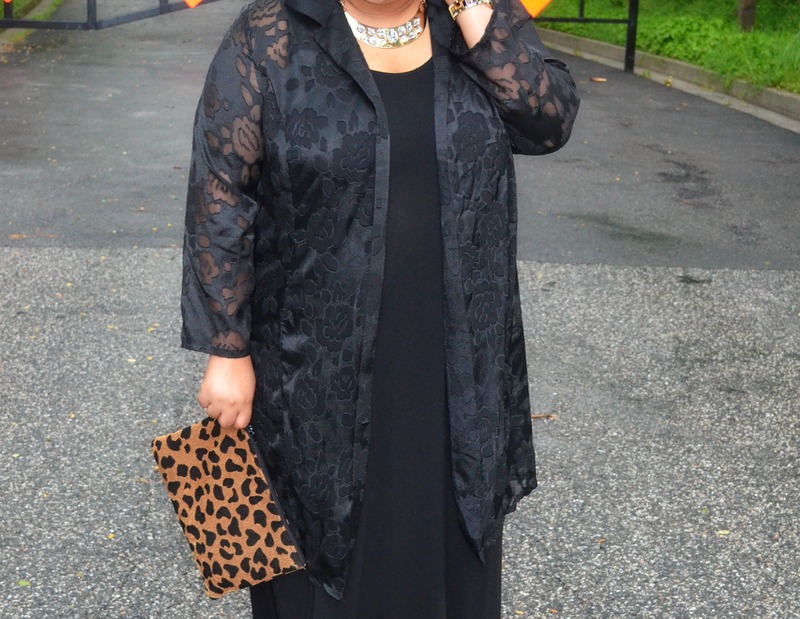 In any event, I’ve been gravitating towards my collection of full-length kimonos. No matter the outfit, I have about 4 kimonos in constant rotation. The one I’m wearing in this post happens to be one of my favorites. It’s perfect for the fickle weather we’ve been experiencing; not too heavy, great length and the perfect fit. Becuase my wardrobe is more on the minimal side wearing a kimono and jeans, or a kimono with a pair of black leggings, has become somewhat of a uniform. As I mentioned in a previous post, creating a work uniform saves so much time and energy in the mornings. But guess what? I’ve also learned that creating a weekend uniform isn’t such a bad idea either! Most of my weekends are spent running errands, attending events for family and friends, going to church, or taking day trips with my husband. Having a few key wardrobe pieces to mix and match is a definite time saver. Sure, you can add different accessories or have several pairs of shoes to choose from, but having the foundation of an outfit already planned is key. 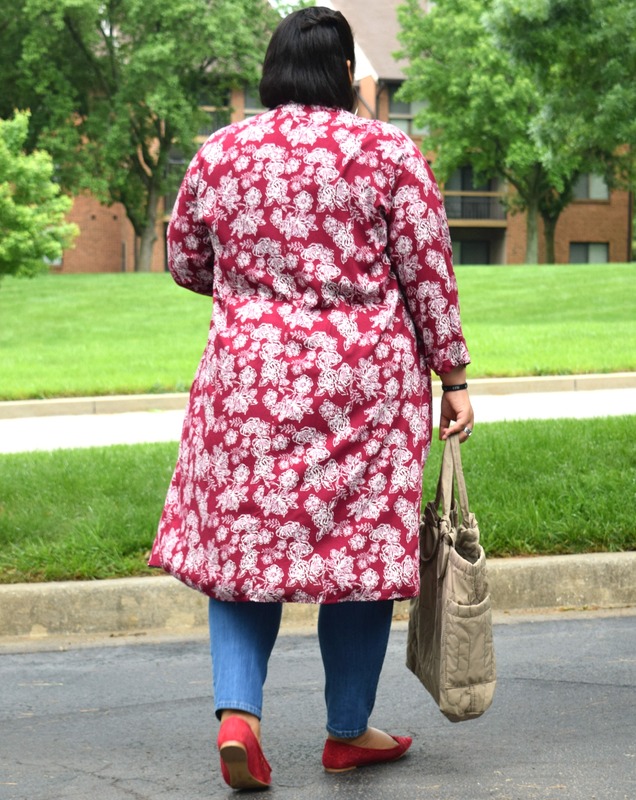 This may sound a little boring, but trust me when I tell you there are several ways to restyle a kimono and a pair of jeans. So tell me, do you have a weekend uniform? 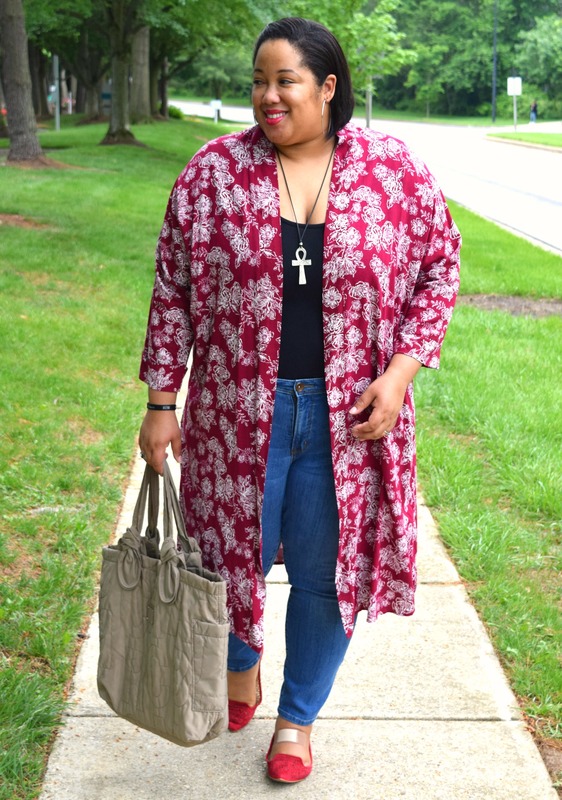 What do you think about styling a kimono and jeans? Let me know! Thanks for reading and be sure to let me know your thoughts below. I absolutely love reading and responding to your comments! Until next time, be blessed and stay safe…XO! Even though it’s been a while since I’ve posted an outfit, not much has changed. 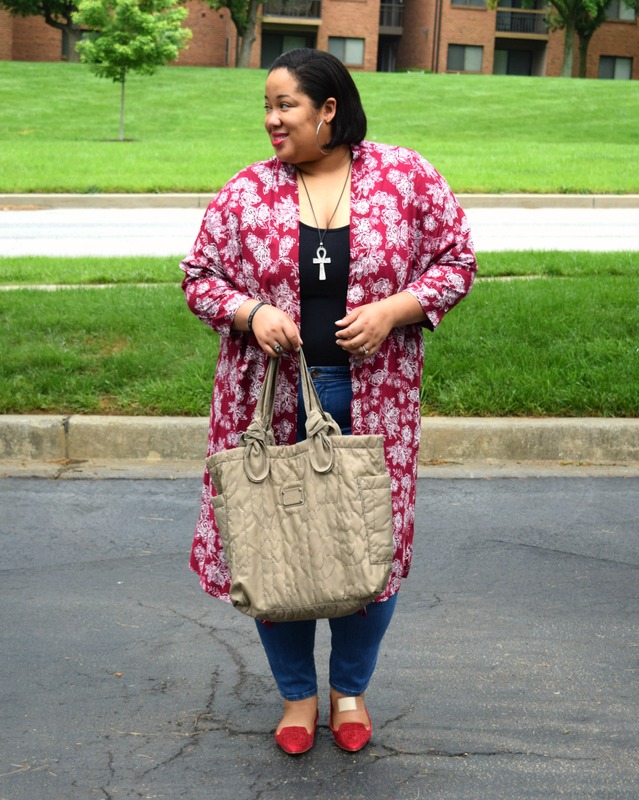 I still LOVE wearing and styling kimonos! 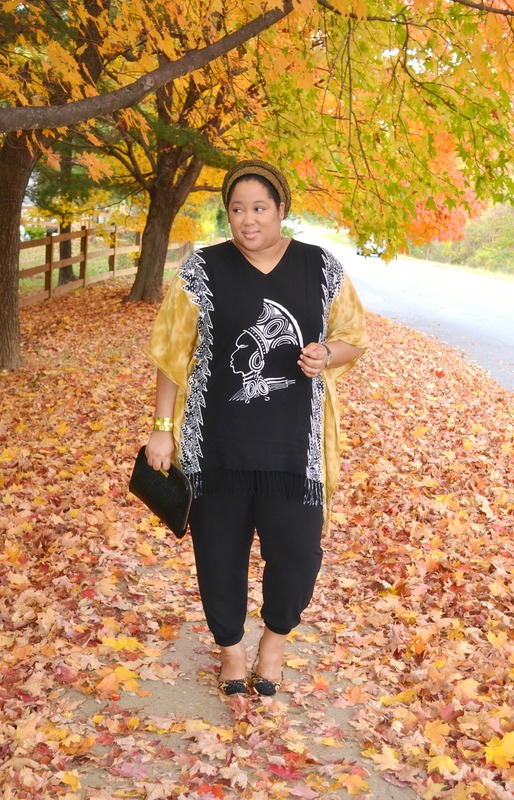 The one styled in this post is actually my latest kimono addition. I purchased it a few weeks back during a shopping trip. 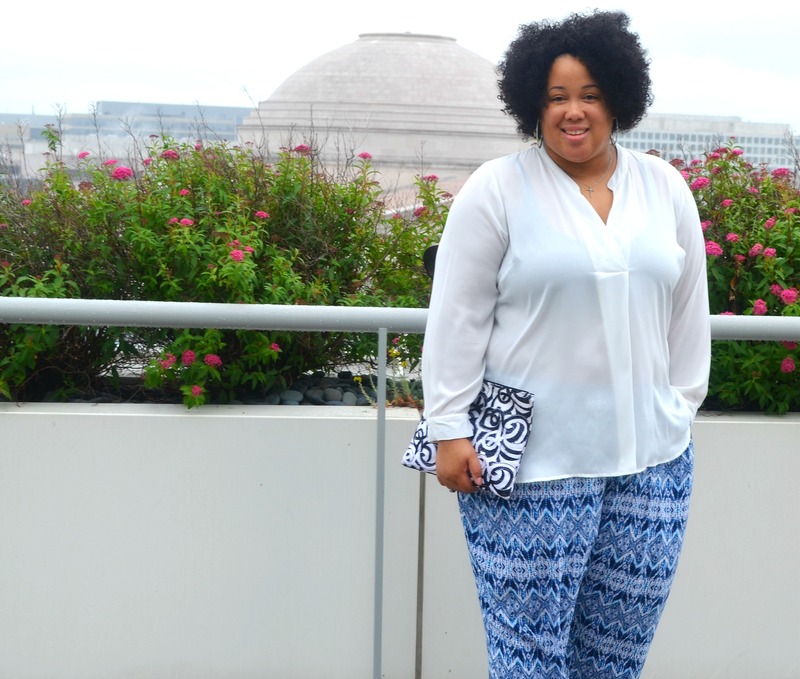 I desperately need(ed) to add some spring and summer pieces to my wardrobe, so I headed to a few places I knew would have just what I was looking for. Of course, Nordstrom Rack was my first stop. Becuase I’ve been taking much better care of my body, thanks to eating healthier and being more active, I’ve shed a few pounds. Buying clothes and being in between sizes makes shopping trips a bit more strategic. I can’t grab an item and go straight to the register anymore. I literally have to try everything on, even bras. No complaints, but it’s something I’m getting used to. 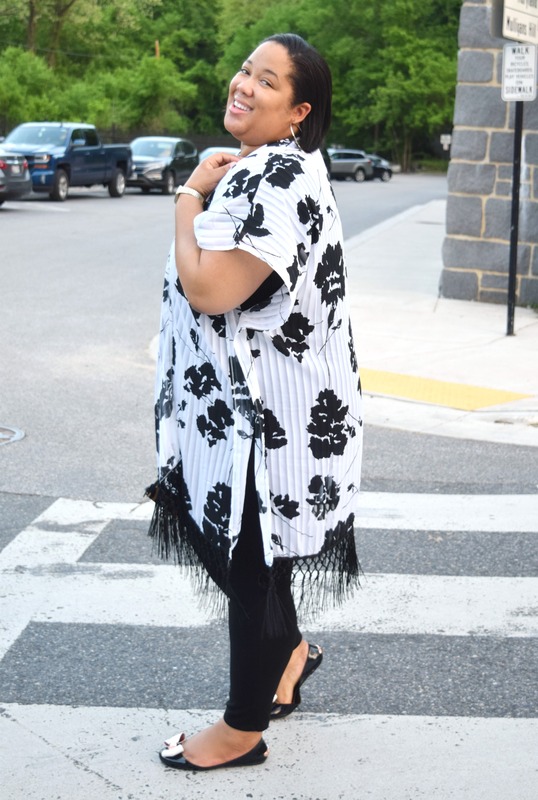 So imagine my surprise when I was able to comfortably fit a OSFA (one size fits all) black and white kimono, found in the regular women’s size section. Can you say, SHOCKED?! Clothes shopping while in between sizes? Try EVERYTHING on in the store before you get home. 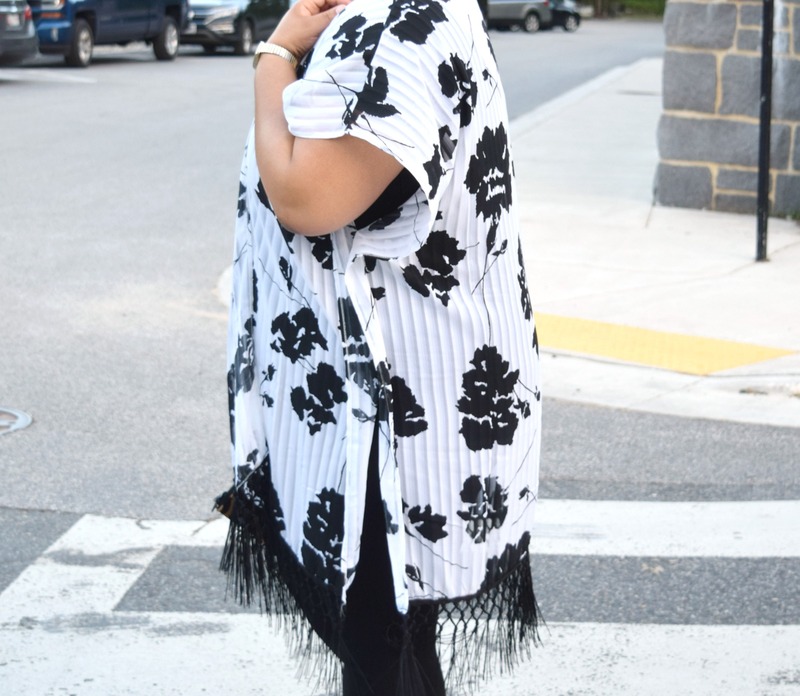 So tell me, what do you think about my new black and white kimono? Let me know! Thanks for stopping by! I’ll be filling you in some more, as far as what I’ve been up to during the past 2 months, little by little in the coming weeks. In the meantime, be sure to join my weekly mailing list. I’ve been sending out Friday emails for 3 months now; it’s a great way to see what I’ve been doing, get a dose of inspiration, and find out some of my monthly favorites. So until next time, be blessed and stay safe…XO! 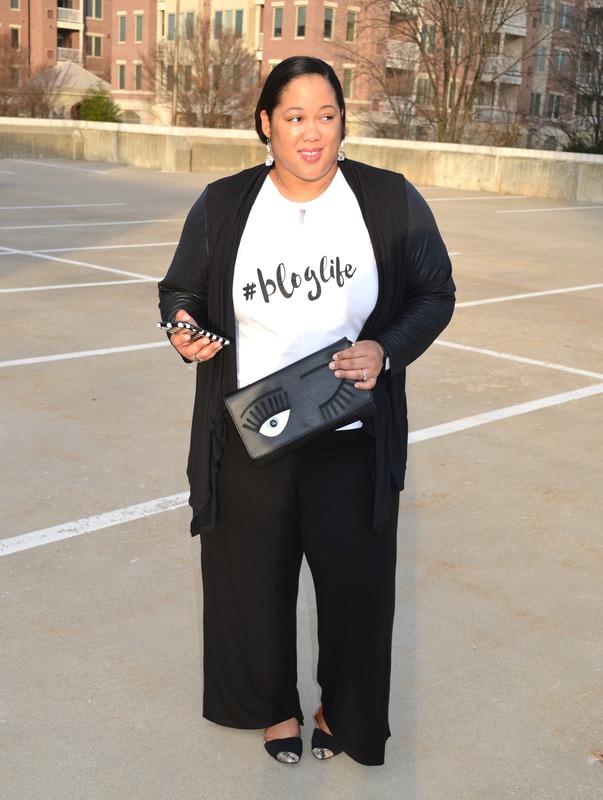 This t-shirt and these photos make me chuckle for two reasons – (1) I’m usually wearing black and white “in real life” and (2) 9 times out of 10 I’m doing something on my phone or iPad for WNJ, a social media client or for Fearless Woman, I am. I’ll admit that I have gotten better about checking my phone every few minutes, however most days between 9-5 I’m working on something. I guess it’s safe to say that I am indeed about #thatbloglife. Wearing black and white along with a cute and clever t-shirt is stylish, for sure. 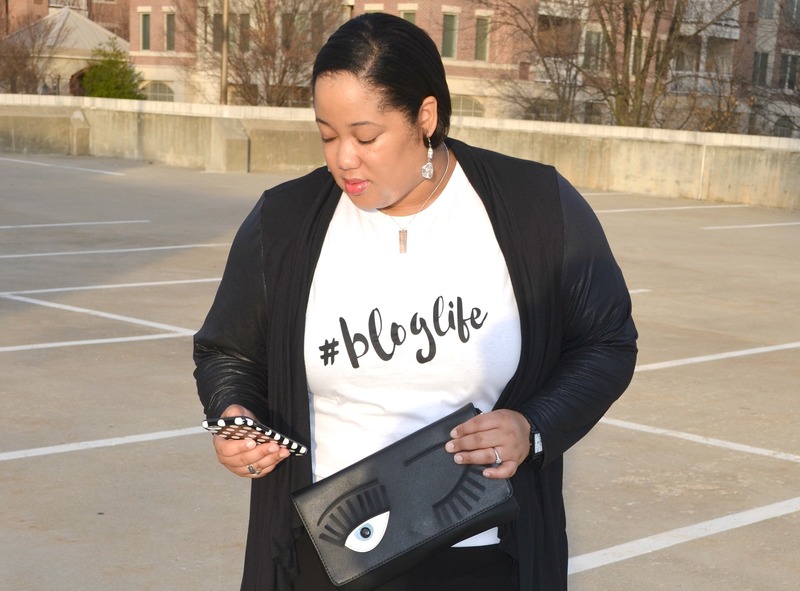 And although #thatbloglife is a cute and catchy phrase, some may wonder what being about #thatbloglife really means. For me, it means 3 things. 1. Being productive, not busy. | For awhile I had this concept all wrong. I was constantly “busy” thinking about what to share next, talking about my next move for the blog/brand and joining any and every blog related Facebook group or chat. Now my mindset has shifted and I understand the difference between being busy vs being productive. I’m now busy being productive. I don’t just think or talk about what’s next; I make an Action Plan and get it done. 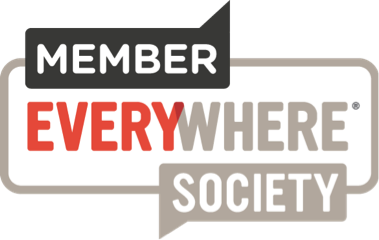 I join and participate in groups and chats that are useful and aligned with my purpose. 2. Being committed to fulfilling your purpose through sharing useful and uplifting content. 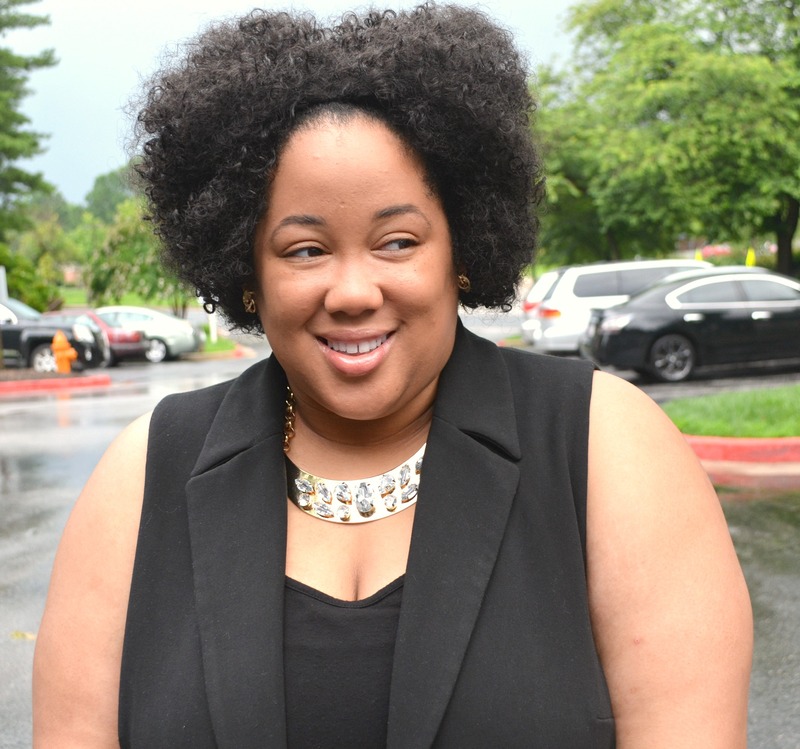 | Earlier this year, I made a commitment (to myself) to fulfill my purpose through blogging. I’ve always had a passion for writing and helping others, but I’ve learned how to infuse passion and purpose in order to make an impact. Some may think you can’t for fill your purpose through blogging, but I beg to differ. Blogging is the perfect platform to share your passion(s) with the world while fulfilling your purpose and uplifting others. 3. Being committed to serve an audience. | Serving an audience goes hand-in-hand with my purpose. It’s very important (to me) that I’m serving my readers while fulfilling my purpose. I want to show and share content that inspires and interests you and every time I’m able to do that, my heart is full. 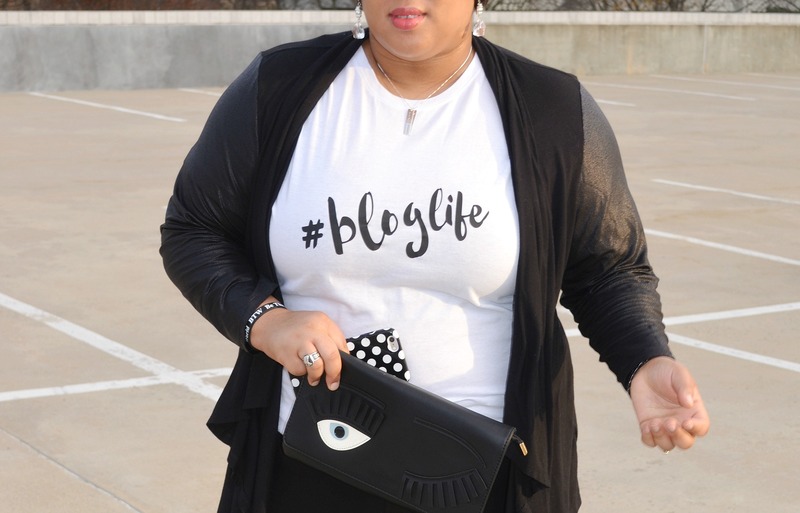 So tell me, what does being about #thatbloglife mean to you? 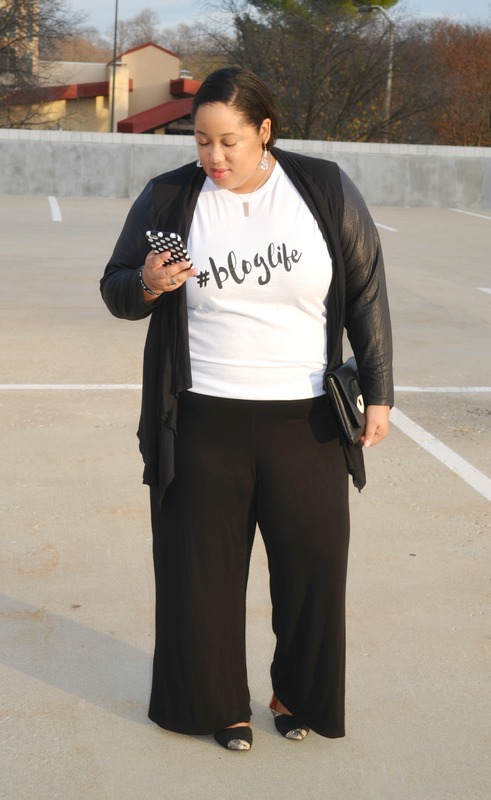 Are you a fan of wearing black and white outfits “in real life” too? Let me know! I must give a shout out to my web designer Kim (Her Name is Kim) for creating these amazing t-shirts. The fit is so accurate and the material is soft and moves with you. I love that! For the first time I was able to order a plus size tee in my size that actually fit! #WINNING Also, being able to style an item that embodies my lifestyle is a major plus. 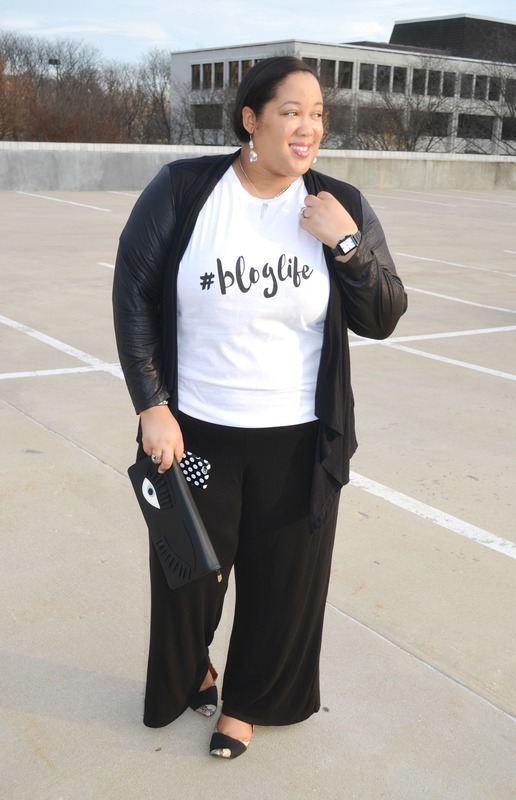 Be sure to visit That Blog Life and grab yours! There are several goodies to pick from. Until next time, be blessed and stay safe…XO! Some days my hair just doesn’t want to cooperate. On those days I grab one of my caps, turbans or tams and keep it moving! That’s exactly what I’ve been doing for the past few days. I love wearing hats during the fall/winter months. I tend to get lazy sometimes with styling my hair, so they come in handy very often. This weekend while hubs and I saw a movie I reached for a comfy and cute outfit, and of course, the outfit included a hat. 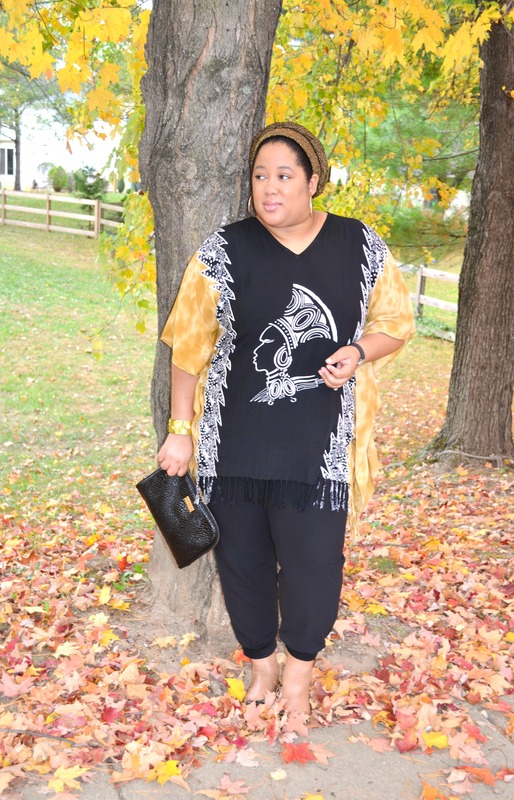 A tunic and black pants are the perfect go-to look for casual weekends. Because the weather hasn’t been brutally cold, I figured wearing these ankle length joggers would be OK. I can probably style them a few more times before the weather drops drastically. The tunic, a thrifted purchase, is actually heavier than it looks. The thick cotton material kept me warm in the theater and thankfully, I didn’t have to reach for a jacket or scarf. So tell me, what do you think about my casual weekend outfit? Are you a fan of the lovely fall weather too? Let me know! Thanks for reading and until tomorrow, be blessed and stay safe…XO! Last year I did a One Dress Many Ways series. 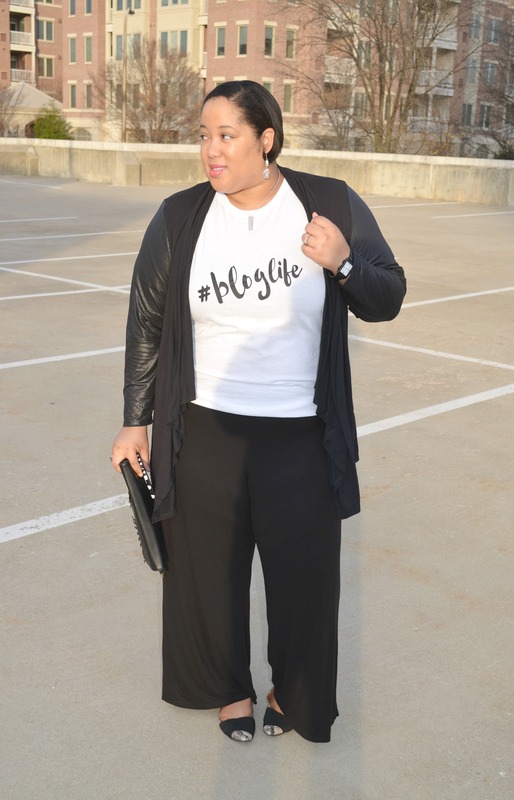 The goal was to re-purpose one wardrobe item and style it 3 different ways for different occasions. It was a fun challenge, so I decided to do that again with another dress; this time I’ve decided to style it 2 ways. 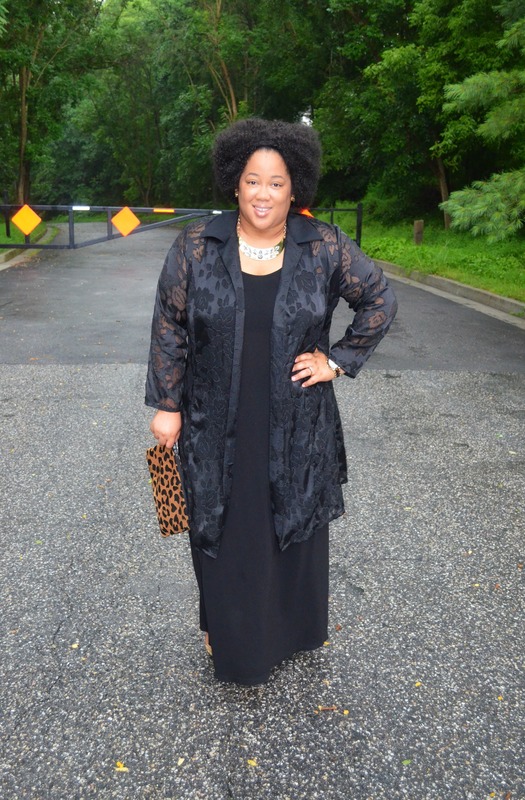 This black maxi dress has been in my closet for years and during the summer months, it’s a definite wardrobe staple. So I figured it was the perfect item to show how to style 1 dress 2 ways. The 1st outfit is definitely a wear to work option. 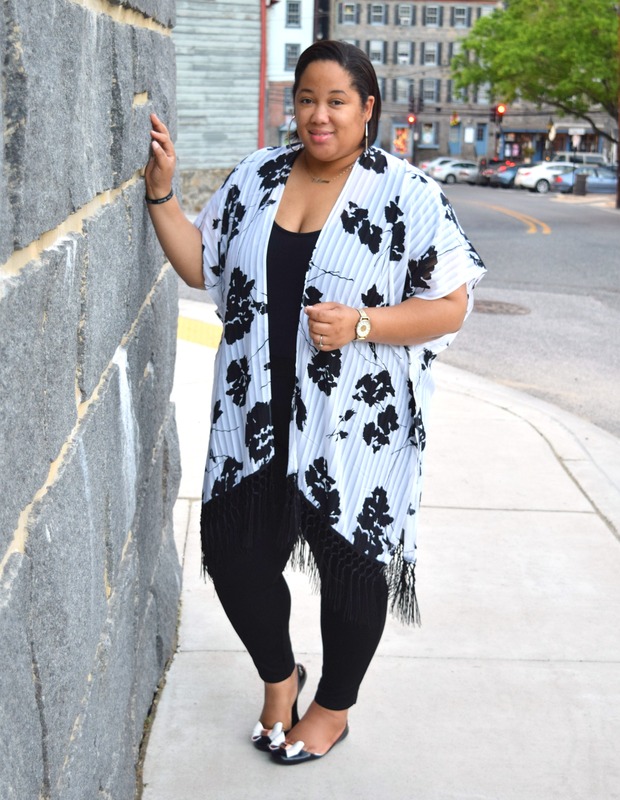 The long cardigan adds a bit of drama to the plain dress and the clutch is a perfect addition, and would come in handy if I had an event to attend after work. While the outfit may seem a bit dressy for some, it’s the perfect mix of comfortable and elegant for me. I like to look nice while at work while still being comfortable. 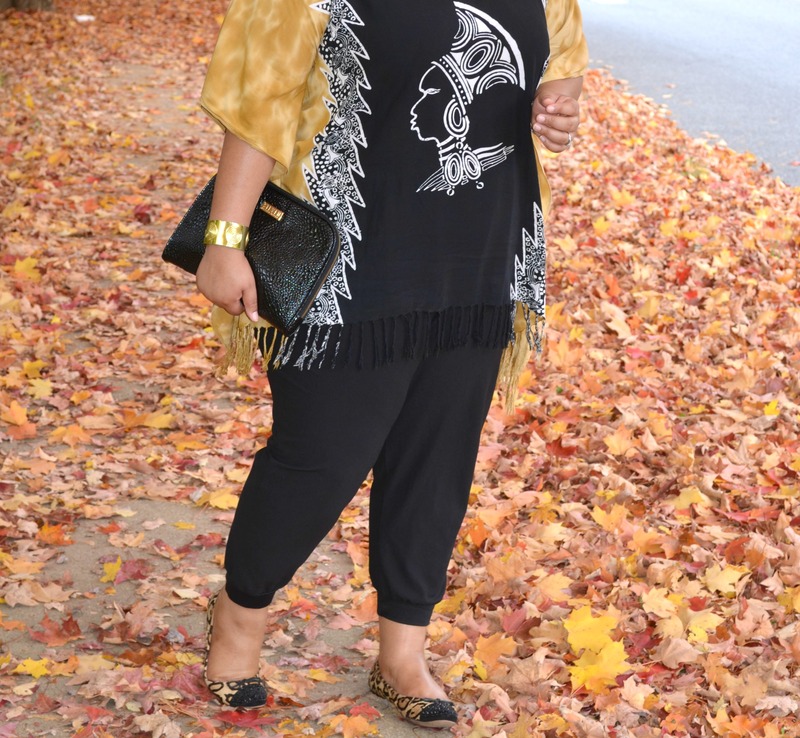 Therefore the “fancy” cardigan and dramatic statement necklace are perfect! 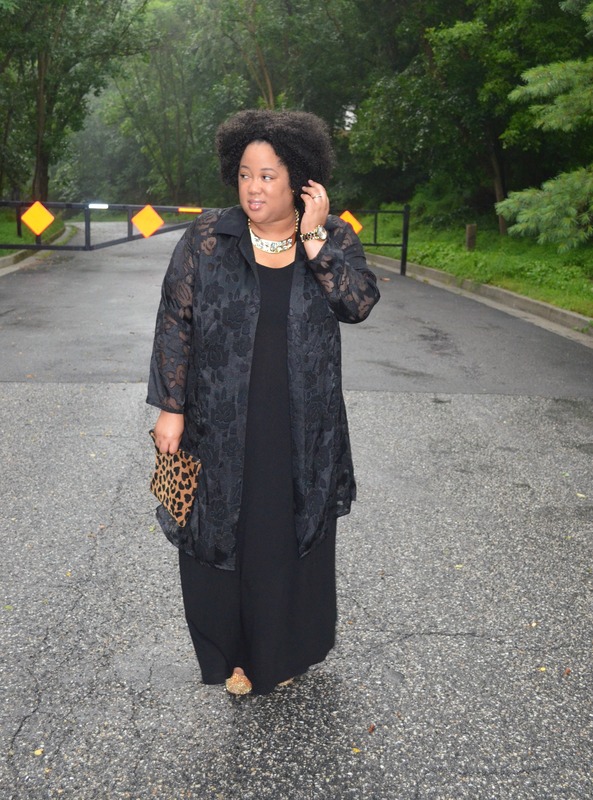 I’m all about saving time and money, so remixing this maxi was very beneficial. The next look is yet another outfit I’d wear to work. 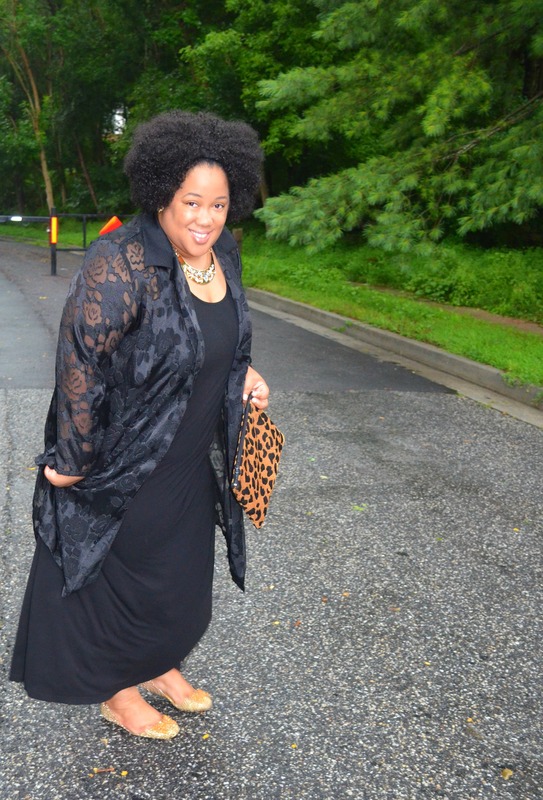 The leopard flats help add a personal touch, something I always do when styling an outfit. Every girl should have at least 2 leopard print accessories, shoes count, in her wardrobe. Trust me, the print goes with everything! In my book leopard print is a neutral, don’t you agree? 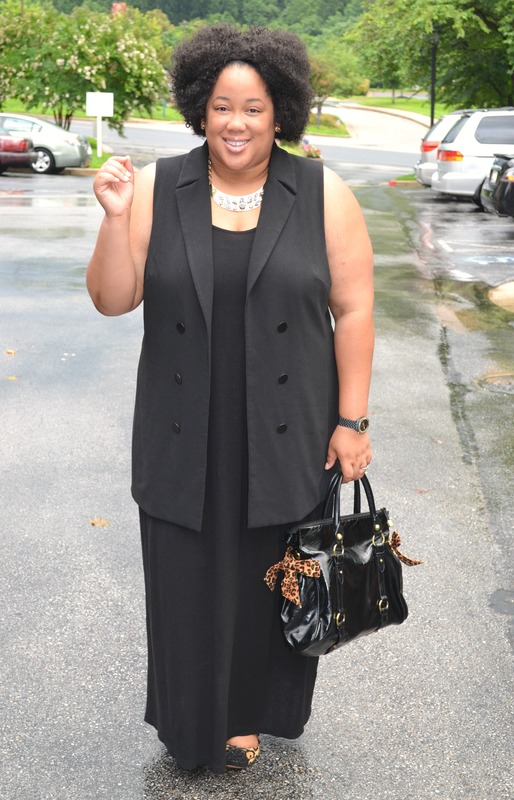 I added also added a black sleeveless vest to give the outfit a chic feel. I actually saw this vest as I was walking to the cash register at TJMaxx a few weeks back. It was in the women’s section, so I was a bit skeptical on how it’d fit. After trying it on, the size large tag was laughable. I usually wear a size 1X and sometimes 2X, depending on the cut of the garment. But this is a prime example of garments being cut larger than expected, and why trying on items is SO important. You just never know how an item is cut and how it’ll fit until you take a few seconds to try it on. So tell me, what do you think about my 1 dress 2 ways OOTD? Are you a fan of remixing items in your wardrobe? Let me know! As always, thanks for reading and leaving your comments. 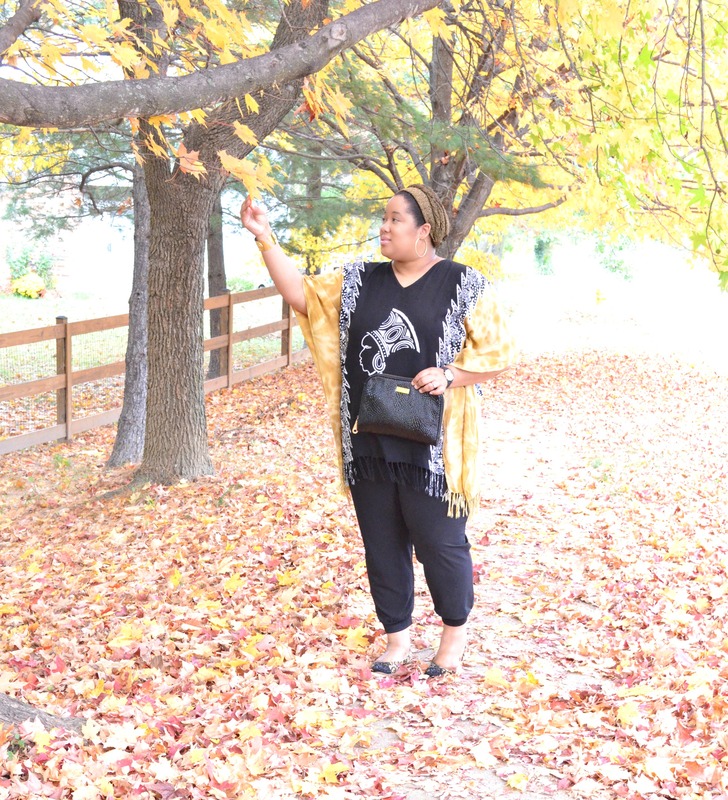 In case you were wondering, there’s still time to enter your recent OOTD to my Personal Style Linkup. 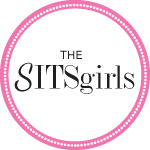 We’ve already got 50+ bloggers who’ve linked up, so head over and join in on the fun! Until tomorrow, be blessed and stay safe…XO! The weather has been a bit dreary lately, but I refuse to let my wardrobe suffer because of it. 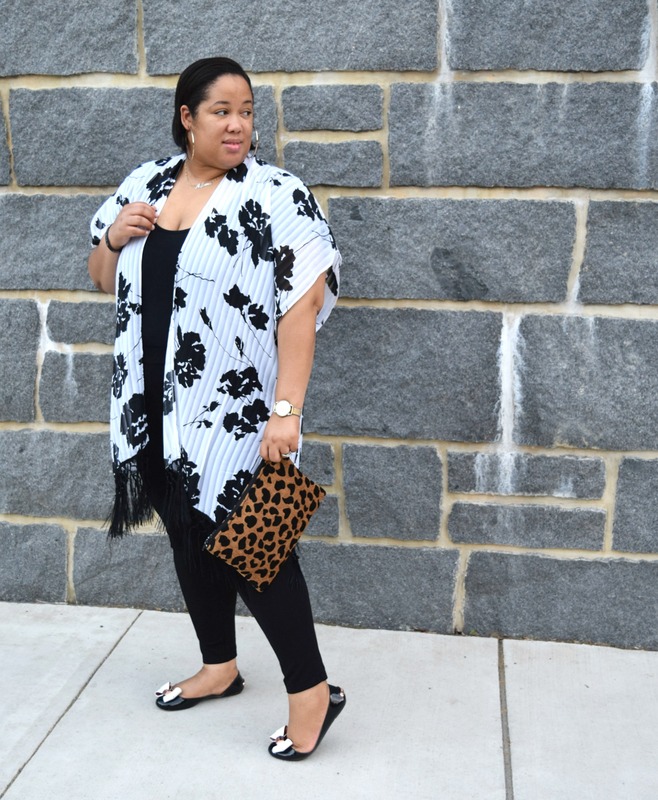 This week, I’ve been determined to still have fun with my clothes and wear enjoyable plus size spring fashion. 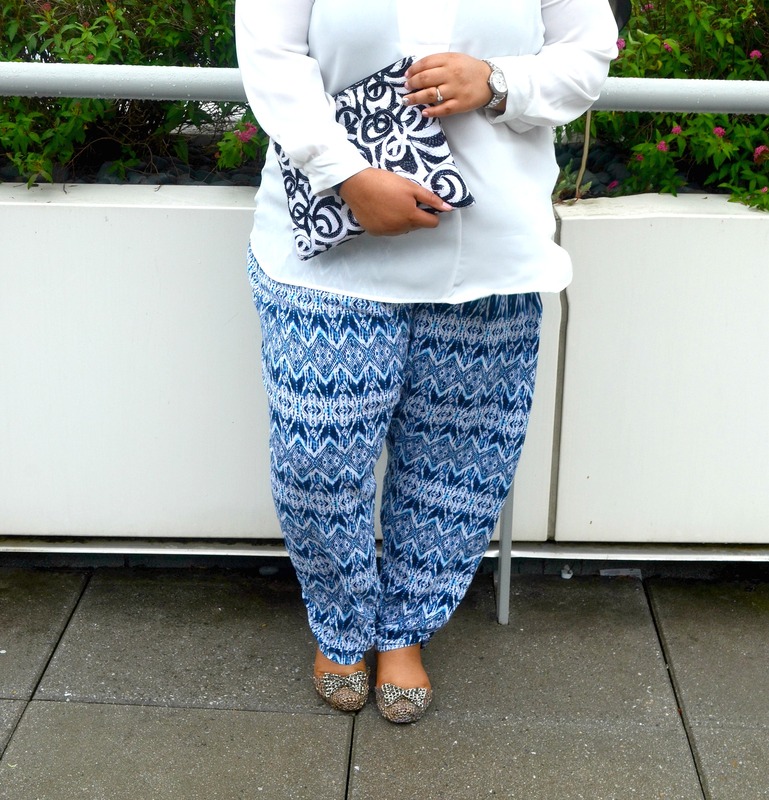 Styling these pants and adding a funky designed clutch to the mix did the trick yesterday, wouldn’t you agree? 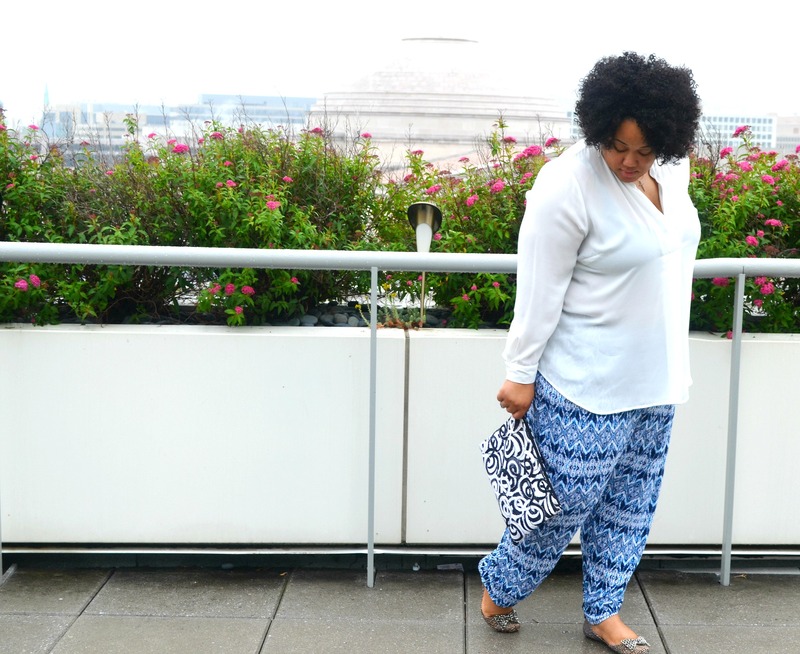 After all, who doesn’t love a loud pair of fancy pants?! I wore this outfit to the Goodwill breakfast in DC yesterday morning. I knew I had to go back to work afterwards, so I wanted to be comfortable yet chic. I think I nailed it! 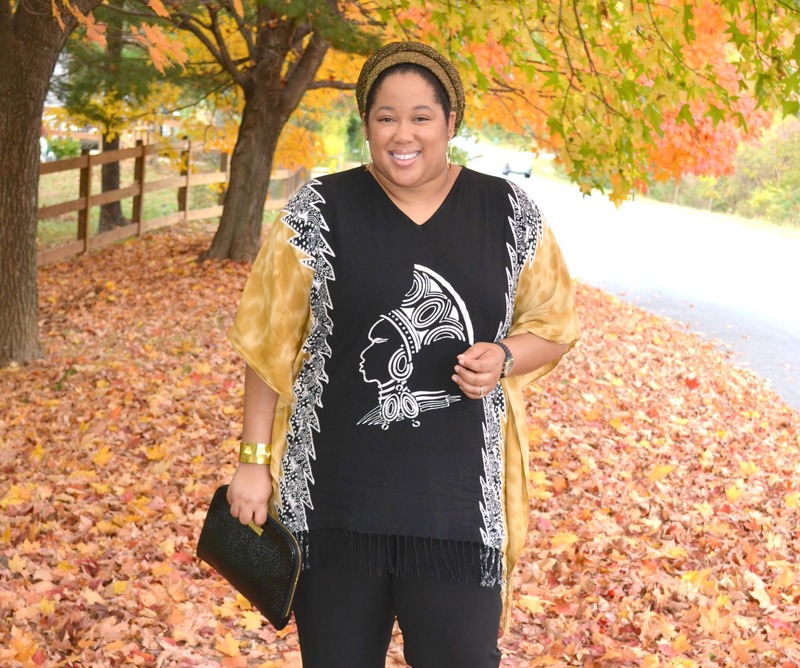 When people see me, I want my personal style to speak volumes, without scaring them away. 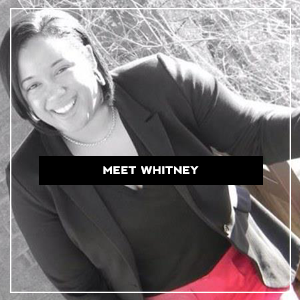 I like to wear outfits that say “Whitney” without being obnoxious. For the event, I also wanted to be sure I was appropriate. Nothing too tight, short, and nothing that would restrict my movement. Mission accomplished! I was smitten with the nice compliments I received on these Steve Madden flats. I purchased them on our recent trip to NC at the Charlottle Preium Outles. This purchase was super sporadic. I walked into the store thinking I’d help hubby pick out a pair of shoes. 20 minutes later, I find myself memorized by the sparkles and glitz on the flats. Of course I had to try them on and of course they fit! The hard part was deciding on which color (gold, pewter or black). So I did the most logical thing and purchased all 3 colors, lol! I ended up receiving a discount on the 3rd pair. That made my purchase feel better. I’m a firm believer that if the shoe fits, and it’s comfortable, wear and buy it in all colors. Momma taught me that! 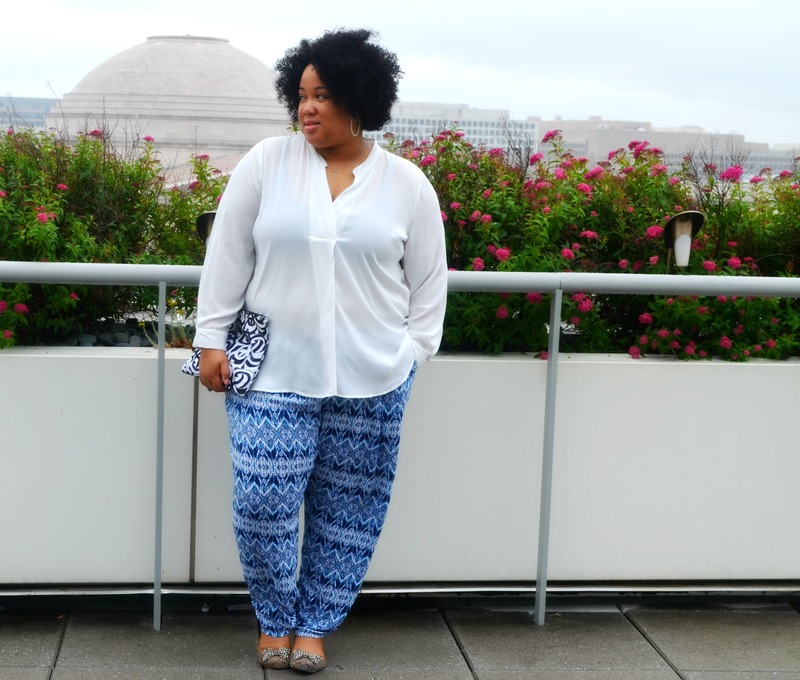 So tell me, what do you think about my fun and funky plus size spring fashion outfit? Do you buy all colors of an item if you love it? Let me know! Thanks for reading and commenting! 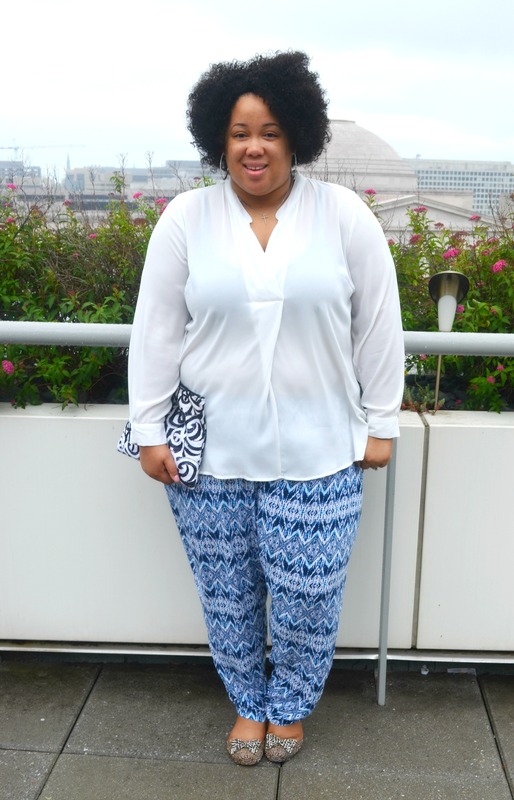 Also, huge thanks to my blogger boo Vivi for snapping these pics. 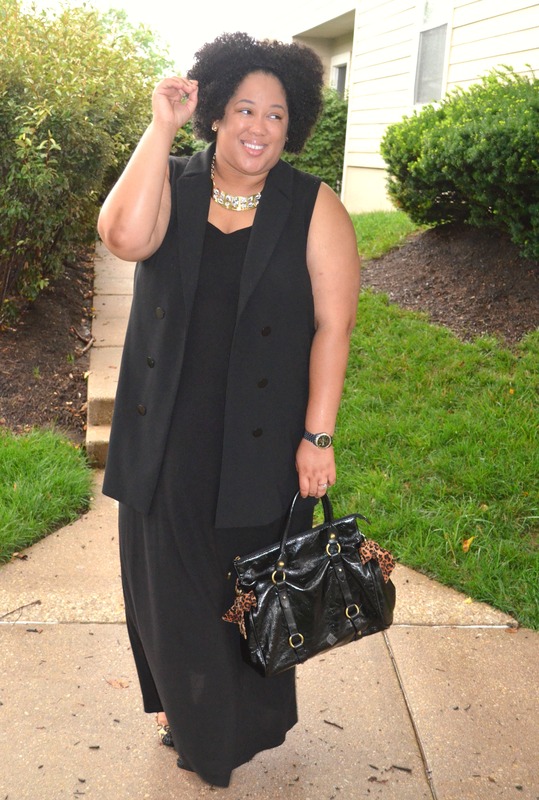 Be sure to linkup to my Personal Style Linkup. Until tomorrow, be blessed and stay safe…XO!